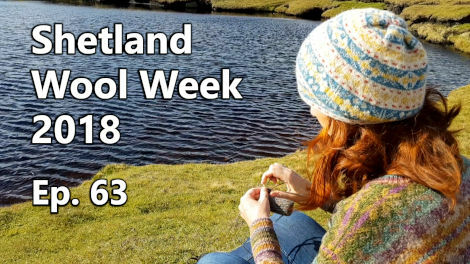 It’s Shetland Wool Week 2018 from beginning to end in Episode 63. We’ve prepared a collection of scenes and experiences to share with you – loads of Fair Isle knitting, the most stunning fine lace knitting, Shetland locals, a few ring-ins, and lots of live music to get you into the Shetland Wool Week spirit. Shetland Wool Week is a week long celebration of all aspects of the craft of knitting. The Wool Week is centered in Lerwick, the harbour and main city in Shetland Mainland, but there are events, like exhibitions and tours, the Ceilidh and the Morning Tea spread right across the islands. The “Hub” is located in the Shetland Museum and Archives. This is a really relaxed space, with comfortable couches and tea and coffee, to let you unwind and get some knitting in. 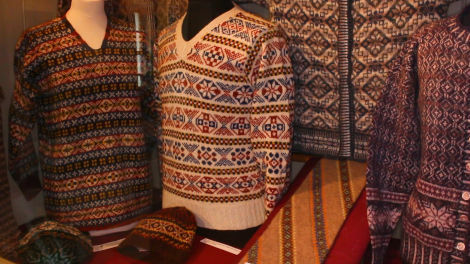 The museum also has a broad collection of vintage knitting, including both colorwork and lace, and information on the history of knitting in Shetland. Shetland Museum and Archives was also the location for many talks. 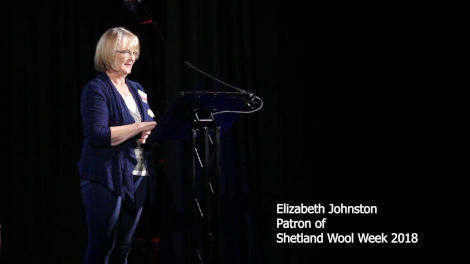 Textile Curator Dr Carol Christiansen spoke about Taatit Rugs, and 2018 Shetland Wool Week Patron Elizabeth Johnston presented a comparison of Shetland and Fair Isle designs. Organised tours were also available. 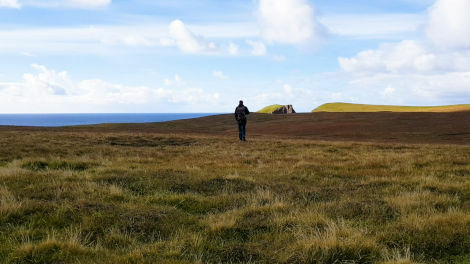 These include tours of various regions, such as a visit to Unst in the far north, known for its very fine lace knitting, and a tour of the island of Bressay, just a short ferry ride from Lerwick, which covered local history and culture but also the island wildlife, and included a visit to the lighthouse. Jamieson’s of Shetland put on a tour of their mill, and there were also a few farm tours available. These tours are a great chance to get a look at the workings of Shetland, particularly if you don’t have your own car. Fair Isle Heels – How to add a Fair Isle Afterthough Heel to your socks. 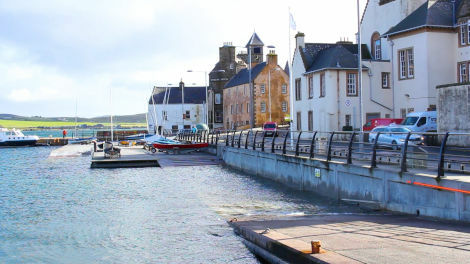 Many of the courses are located in Lerwick and can be reached by foot if you’re staying in town. If a course is outside of Lerwick, then transport may be provided, but you would need to check the Wool Week site to be sure. 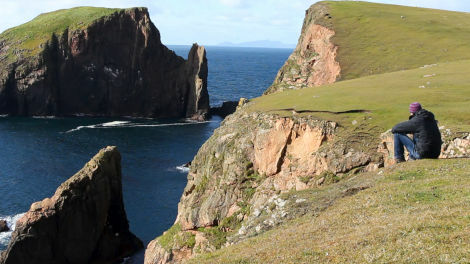 Shetland is an archipelago, a collection of islands, 16 of which are inhabited, and lies around 100 miles north of mainland Scotland, and also around 200 miles west of Bergen in Norway. Although Shetland is part of Scotland, the influence of the Norwegian culture is visible in the architecture, names and in the Shetland dialect. 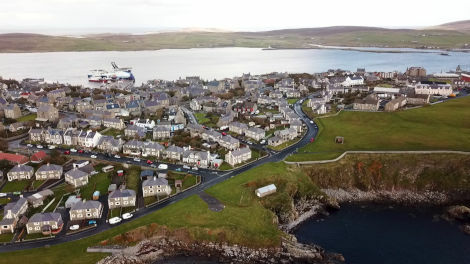 The largest island is called Mainland, and Lerwick is the major city, having around 7,000 of Shetland’s 23,000 total population. Travel between the islands is by ferry, either on foot or with your car. It’s easy, but you need to consider timetables and you might want to book, especially if you are planning a longer day trip. As mentioned by Patron Elizabeth Johnston, the weather on Shetland is very varied. Clouds and rain can make way for sunshine several times on any day – it’s a great place for rainbow chasers. It can also be very windy. It’s not overly cold, but we’d recommend having a good raincoat with you! This is our second interview with Hazel Tindall. We interviewed Hazel last year (Ep. 39) during the 2017 Wool Week . Back then Hazel talked about her grandmother, mother, aunts and sisters all knitting to supplement the family income and how she was already designing Fair Isle yokes at aged 12. 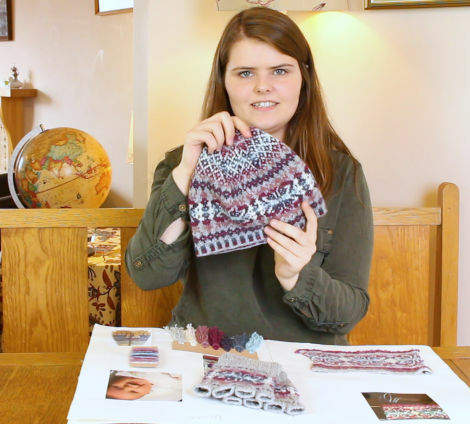 In this interview we chat about some unusual knitting and crochet projects that Hazel has been working on more recently. We meander from one theme to another an Hazel drops in snippets of very interesting historical knitting info. 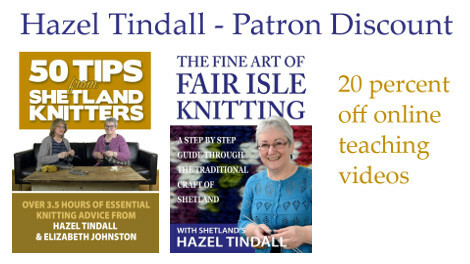 Hazel has produced two great video series where she shares the expertise that she has gathered as a long time Shetland knitter. They also include instructions on how to use the knitting belt and how to knit more efficiently. 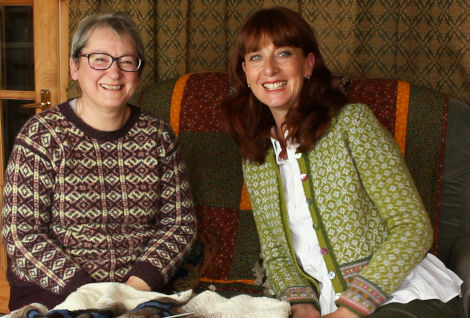 50 Tips from Shetland Knitters, produced in collaboration with Shetland Wool Week 2018 Patron Elizabeth Johnston, which includes knitting tips and answers to the questions that Hazel and Elizabeth have been asked over the many years that they have been giving classes and workshops. There is a tremendous amount of brilliant information in it. 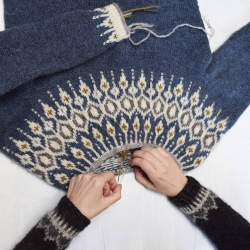 The Fine Art of Fair Isle Knitting, which takes knitters right through the process of knitting a Fair Isle cardigan including instructions on steeking and finishing. The discount is valid until 30 October 2018. Full details are available here. We have another interview with Hazel Tindall in Episode 39. 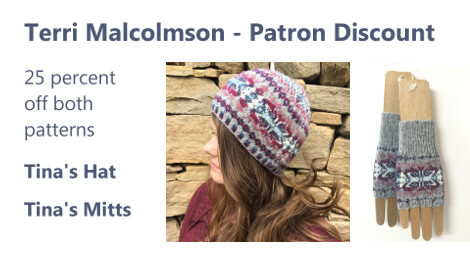 Terri Malcolmson is Shetland born and bred and has grown up surrounded by knitting, her grandmother Wilma is the founder of The Shetland Designer which is one of the early knitwear design companies in Shetland. We interviewed Terri with her grandmother back in episode 44. Terri is a very good machine knitter and hand knitter, she was one of the teachers during the Shetland Wool Week this year and has started her own business designing Fair Isle hand knit patterns and machine knits on commission. 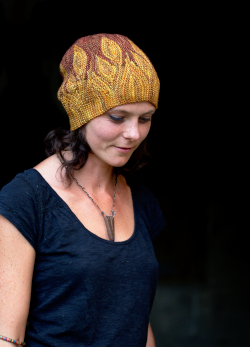 Terri is offering Fruity Knitting Patrons a 25 percent discount on her two patterns Tina’s Mitts and Tina’s Hat. The offer is valid until 30 October 2018, full details are available here. We did another interview with Terri Malcolmson in Episode 44. 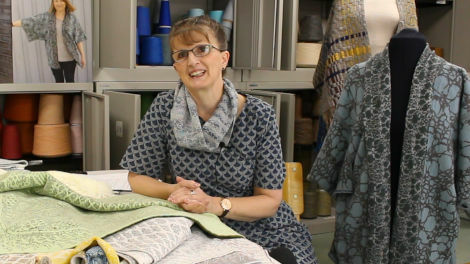 We take you to the Textile department of the Shetland College of Highlands and Islands. In past Wool Weeks the Shetland College Textile department has put on a fashion show during the opening ceremony. 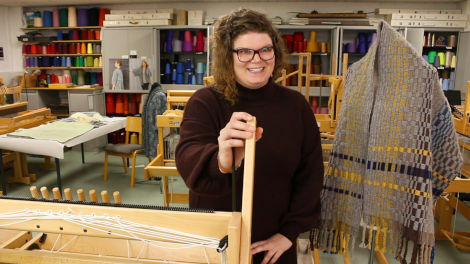 You will meet Elaine (above) who is a Shetlander from the island of Whalsey and who has a strong connection to knitting in her family background. 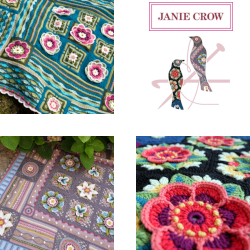 Elaine has taken traditional lace patterns and transformed them into modern textiles in a very interesting way. It’s also very moving to hear the family stores that have inspired her. Faye Hackers (lecturer and program leader) also shows us some of the design work from the weaving department and as well as the knitting machines. Last year Andrea bought some tweed material from Jamieson’s of Shetland, one of which was made rather unsuccessfully into a skirt. Since then she has learnt a few more sewing tips and is feeling more confident so two more pieces of tweed were bought. One for a skirt for Madeleine (our daughter) and one for herself. Andrea also bought yarn to make a Heart’s Content by Jennifer Beale (pictured above) from Jamieson’s of Shetland and some yarn (yet to be shown) for my next project. The Butterfly. Kid on the Mountain. The Banshee. Gravelwalks. The Old Copperplate. Help! I can’t access this latest podcast. You’re just a little quick for us, Tiferet. Should be good now! Greetings, Thank you for bringing wool week to us. You make it feel as if we are there with you. I have been unsuccessful in accessing the offer from Hazel Tindall. When I use the button for it, I am put into Patreon and invited to become one. I am already s merino and have never been able to access the Patreon podcast. Clearly, I am doing something wrong. Any suggestions would be welcome. That’s a beautiful colour scheme in the sweater in the photo at the top of this post (the red-haired woman sitting on green grass above the sea). Can you tell me the name of the pattern? Hi Pamela, You can hear about that design in Episode 42, with Marie Wallin. And you can hear about the completed project in Episode 51. Cheers, Andrew. Lovely episode! I’m going over to my mom’s now to watch it with her. I know she’ll love it, too! Hi Andrea and Andrew. 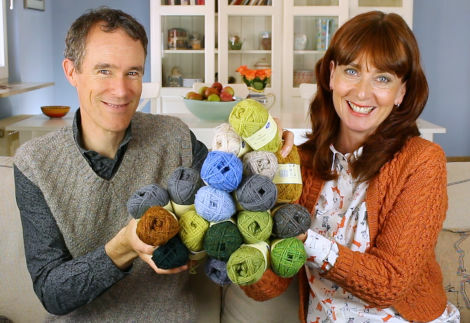 Not been able to knit for quite a while due to Arthritis, so sorry not watched your Videos for a while, but when I saw issue 63 “Shetland Wool Week” had to watch. You produce excellent videos, it was like being there with you. Shetland is stunning. So sad I am not in a position financially to travel there, it would be a dream come true. As I live in England, and the currency is Pound Sterling, how would I convert this on your website? I am interested in becoming a Patron if it suits my budget. Any advice you can offer would be appreciated. Keep doing the excellent videos. Thank You. Hi Mary. You should be able to select the amount you would like to pledge in US dollars and it will be converted and charged to you in Pounds. Your bank will charge you a small amount for the conversion. You can get an idea of the current conversion rate by googling “1 USD in GBP”. Hope that helps, and thanks for watching! A + A. Thank you Andrew. 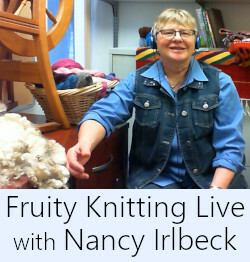 I really enjoyed both those podcasts and am now going to follow Fruity Knitting. 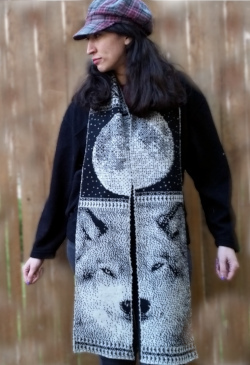 I will also be knitting Marie Wallin’s Samphrey as soon as I finish all my Christmas sock knitting. Lovely episode! So happy to come across your podcast. I was there this year (first time participating) and it’s been wonderful listening to your interviews, watching your videos on the vast, beautiful landscape and many other things I had missed, listening to the music you’ve thoughtfully included that goes so well with the content. I felt very touched especially by the video of Andrea playing a hymn in the church. It was amazing. 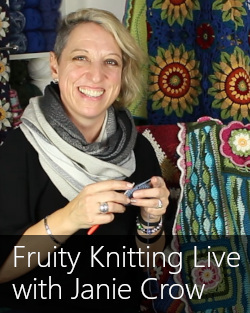 I couldn’t resist and went on to watch many more episodes of Fruity Knitting. I love the interview with Lucy Hague. She’s such a genius. I’m excited to know you have a previous episode featuring Marie Wailin! I’m going to watch it too. Thank you Andrew and Andrea for your hard work. I would love to show my support as a patron. Bernice, great to hear that you’re getting so much out of the show, and thank you for your support! A + A.